We empower self-directed IRA investors to grow tax-advantaged wealth and retirement savings through alternative investments. As an independent, passive administrator, our focus is simple: Your needs as an investor. Built by investors, for investors. We understand the urgency of each investment. iPlanGroup is structured to keep the investing process as smooth, easy and efficient as possible for you. Simplified fee structure. While other providers have complex fee structures, we keep it simple. We don’t charge transaction fees, which is especially important for new and more active investors. Dedicated service team. With our firm, you are connected to an experienced team that works to understand your investment goals and support your needs. 24/7 online access. Our online portal gives self-directed investors 24-hour access to their account for complete management flexibility. What are Self-Directed IRA Services? Stay up to date on the latest from iPlanGroup. 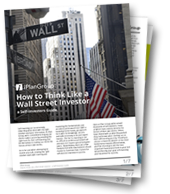 Want to Learn How To Think Like a Wall Street Investor? iPlanGroup has no responsibility or involvement in selecting or evaluating any decisions you make for your account and cannot offer any investment, legal, or tax advice. We cannot guarantee, endorse, accredit, certify, or back any investment. We strongly encourage you to consult with the appropriate professional(s) licensed in that area before entering into any type of investment. Built by investors for investors.